So it's about time one of the biggest stars from The Nightmare Before Christmas was featured in his own lunch. After all, Oogie Boogie was Jack Skellington's "enforcer." He is the one who held Sandy Claws hostage so that Jack could fulfill his mission. He also has one of my kids' favorite songs in the movie, so he has that going for him as well. I am also on a "Nightmare" kick so this is my third lunch in a row on this theme. 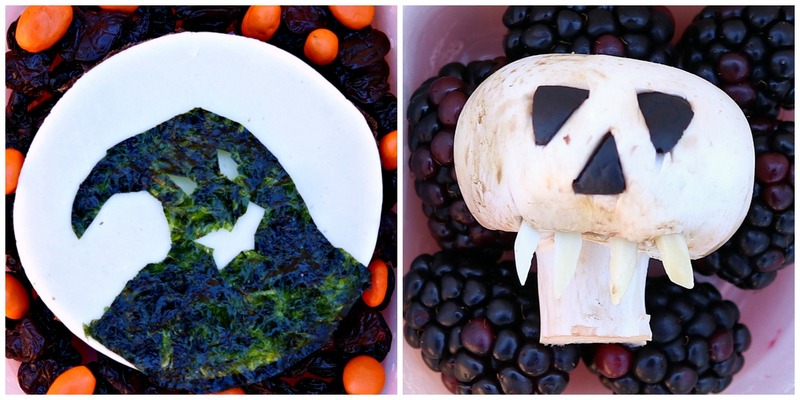 To see all the other Nightmare themed lunches I have made over the year's, CLICK HERE. 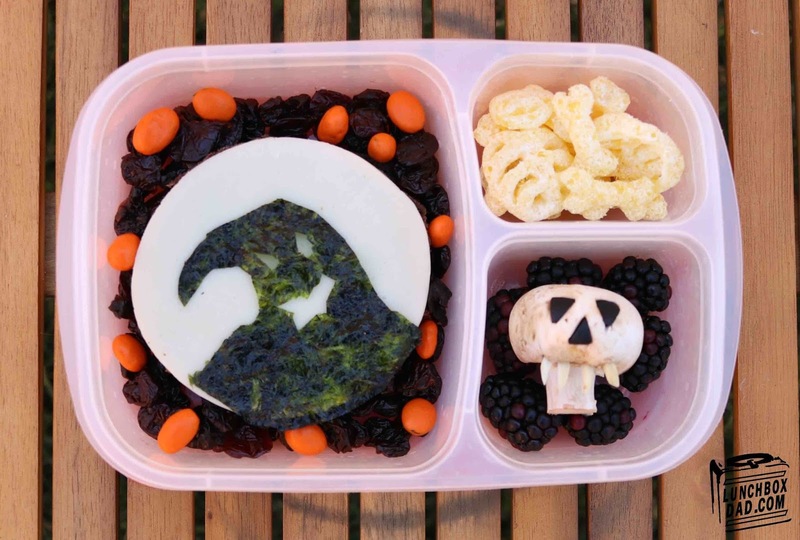 I created this lunch in an Easy Lunch Boxes container and yes there is an actual sandwich underneath Oogie Boogie. The cheese is just the top for it! If your kids are as big a fans of The Nightmare Before Christmas as mine are, they will love this lunch. Directions are below! 1. Cut the Oogie Boogie shape out of nori. It's easier than it looks, just use scissors. The beauty of it is he kind of a blob so it doesn't need to be exact. Place him on top of provolone cheese slice. Make the rest of the sandwich and put the cheese on top. Place in main compartment and surround with dried fruit and yogurt covered raisins. 2. Cut three triangle shapes out of mushroom. Cut three triangles out of olive. Stuff olive triangles in mushroom. They should fit without falling out. Stick in almonds for teeth where shown. Place in side compartment and surround with blackberries. 3. In second side compartment place bone shaped or other Halloween shaped chips or pretzels.